Charles L. Quarles, Illustrated Life of Paul (Nashville: B&H, 2014). The writings, theology, and life of the apostle Paul continue to generate interest. Some works seek to present new and novel ways of approaching the subject, whereas others take a more traditional approach. This work by Quarles falls into the latter category. This volume is commendable for several reasons. First, it is clearly and concisely written. The discussion is fairly thorough but not exhaustive. But those who are looking for a presentation, critique, and examination of recent trends in Pauline studies will likely be disappointed. Second, this work is faithful to the biblical narrative. The book of Acts is treated like a reliable historical source and the author accepts the thirteen epistles of Paul as genuinely Pauline. For those interested in such things, Quarles holds the South Galatian view and two Roman imprisonments. Third, in keeping with its title, this volume is nicely illustrated. There is a good blend of photos and illustrations throughout. Finally, the volume includes both subject and Scripture indices that help to contribute to the usefulness of the volume. There are a few weaknesses of this volume. I do wish that a few more excurses on some disputed issues would have been included (e.g., the new perspective, Romans debate, etc.). I noticed only one excursus related to the relationship between Galatians 2 and Acts 15 (p. 78).The author’s description of the oft-referenced immorality of Corinth (p. 120) should be more nuanced in light of the work of Jerome Murphy O’Conner and others. A third issue is more of an issue of preference, but I believe that this volume would be easier to use with footnotes rather than endnotes. 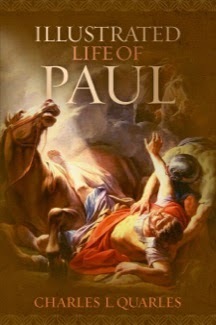 But these criticisms notwithstanding, Illustrated Life of Paul is a solid option for those interested an introductory level resource to the life, ministry, and writings of Paul. You can access a PDF excerpt here.